The Al-Haram Al-Sharif Complex (the Noble Sanctuary) also known as the Temple Mount and the Al-Aqsa Mosque are one, and no work to damage its unity should be allowed, Culture and Tourism Minister Nabi Avcı said during a visit to Masjid al-Aqsa in Jerusalem on Wednesday, as he urged more Turkish citizens to visit the holy site in Jerusalem. 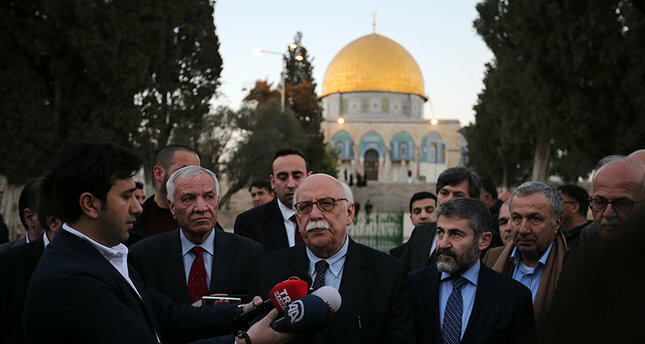 Avcı, who was in Israel as part of an official visit to attend an international tourism summit, marking the first time a Turkish official at the ministry level paid an official visit to Israel since relations between the two countries have been restored, said that the complex is significant for all Muslims as it was the first qibla (the direction for prayers) and is a holy place...Avcı, who was welcomed by the director of Masjid al-Aqsa Omar Kiswani, reportedly prayed in the mosque and urged all Muslims and Turkish citizens to visit the site. Meanwhile, Palestinian officials in the complex welcomed Avcı's visit, and noted that such visits by senior officials means a lot for Palestinians. Referring to the latest resolutions by the United Nations Educational Scientific and Cultural Organization (UNESCO), Avcı said that the Temple Mount is a holy site for the Jews, Christians and Muslims, and should be protected as it is a cultural heritage.